Heinrich Bartelt reported in an interview in the fall of 2006 that wind energy land leases (pacht in German) were typically 5% of gross revenues. In his projects in Sachsen Anhalt, Bartelt sets aside 1% of this 5% for the nearest villages. Of this a portion is set aside for community groups, sports halls, and so on. Of the 4% remaining half is paid to landowner (2%) and half (50%) is distributed among surrounding landowners. Many Bürgerbeteiligungs or share cooperatives in Germany post their prospectuses on the internet. The royalty paid to landowners is clearly stated in the financial summary documents. It may surprise North Americans, but landowners with wind turbines on their land receive only 70% of the royalties paid for land leases in Le Haut des Ailes. The remaining 30% is paid to adjoining landowners who have to live with the wind turbines, but who were not fortunate enough to have one on their own land. This practice has become common in continental Europe, especially in neighboring Germany, where they had to confront "Turbine Envy" much earlier. To spread the royalty benefits to as many landowners as possible, Erélia (the project developer) moved some of the turbines slightly from their ideal locations to neighboring properties. Similarly, Erélia worked with local landowners to avoid dividing the 30% of royalties into too many portions. They tried to limit payments to those farmers adjoining the property and within 80 meters of each turbine. Payments were also made to landowners for passage of roads and cables. Throughout the negotiations, Erélia kept all property owners informed. Each affected property owner was informed of what all the others would be paid. While this information was not made available to the public, it was provided to all property owners. This contrasts markedly with the secrecy common among royalty transactions in Canada and the United States. After visiting northern Europe, Prince Edward Island's Minister of Energy Jamie Ballem proposed a similar revenue sharing arrangement for wind turbine land leases in the province. In a presentation at the CanWEA conference in Toronto in the fall of 2005, Ballem said that the provincial power authority will pay a royalty of 2.5% of gross revenues from the project. The lease payment will be divided among three zones: those with turbines on their land, those within 100 meters of the turbines, and those within 300 meters. 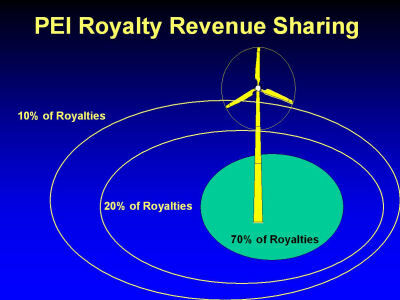 Those with turbines on their property will receive 70% of the royalty revenue. Those within 100 meters, 20%. Those within 300 meters, 10%. Prince Edward Island is one of the windiest places in Canada. Wind speeds at sites permitted for wind development average 9.5 m/s. Ballem estimates that a 90 meter diameter turbine will generate $14,000 CAD per year in revenues to landowners where the turbine stands; $4,000 CAD per year to those within 100 meters; and $2,000 CAD per year to those within 300 meters.